Crispy hand-made thin crust pizzas made with our special one-of-a-kind sauce. Sausage, pepperoni, bacon bits, Canadian bacon, and hamburger. Mushroom, onion, tomato, green pepper and green olive. 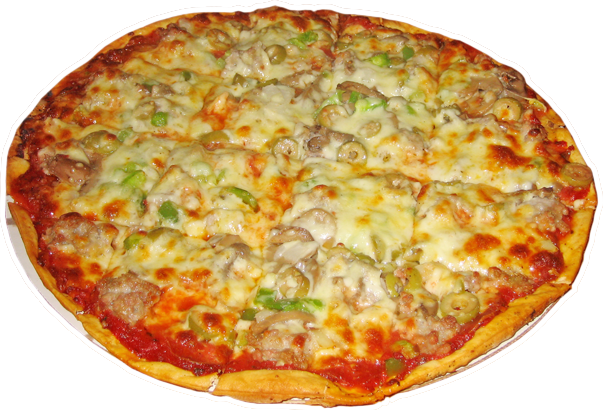 Sausage, pepperoni, mushroom, onion, green pepper, and green olive. Taco meat and cheddar cheese, topped with fresh lettuce, tomato, onion, black olives, taco chips, and sour cream. Special sauce, dipped chicken, jalapeños, onion, green pepper, and mozzarella. Taco meat and cheddar cheese, topped with fresh lettuce, tomato and taco chips. Hamburger, bacon, American and mozzarella cheese, topped with fresh lettuce and pickles. Thousand Island dressing, hamburger, and cheese blend, topped with fresh lettuce, onion, and pickles. Whet your appetite with these favorites. cocktail, tartar, salsa, sour cream, and guacamole. Delicious cheese-filled hashround potato bites. 12 pc. Choose from BBQ, bourbon, honey garlic, hot, mild, naked, sweet chili, sweet & sour, and teriyaki. Choose from 4 different appetizers to sample. Items unavailable in sampler include: Chili Cheese Fries, Cheese Curds, Garlic Bread, Garlic Bread with Cheese. Fried and lightly salted tortilla chips, piled high with taco meat, nacho and cheddar cheese, tomatoes, onions, black olives, jalapeños, salsa, sour cream, and guacamole. All burger baskets are served with a pickle. 1/3 lb. burger on a toasted bun. 1/3 lb. burger with American or Swiss cheese on a toasted bun. Bacon • Canadian Bacon • Pepperoni • Chili • Cheddar Cheese • Lettuce • Tomato • Onion • Jalapeños • Mushroom • Guacamole • Green Pepper • Pickle • And More! Hamburger cooked rare, medium rare, or pink in the middle may be undercooked and are served only per request. Whether dining in or preparing food at home, consuming raw or undercooked animal food may increase the risk of food borne illness. All sandwich baskets are served with a pickle. Large soft shell tortilla shell stuffed with taco meat, cheese, lettuce, tomato, black olives, and sour cream. Crisp bacon, fresh lettuce and tomato on toast. Ham, turkey, and bacon piled high with fresh lettuce, tomatoes, and mayo on 3 pieces of toast. Thin sliced ham piled high, topped with American or Swiss cheese, served warm. Ham and turkey piled high, topped with American and Swiss cheese, served warm with thousand island dressing. Tender grilled chicken breast topped with fresh lettuce and mayo on on a toasted bun. Cod fish filet, fresh lettuce, and tartar sauce on a toasted bun. All salads come with one side of dressing. Choose from: thousand island, French, light Italian, ranch, bleu cheese, taco sauce, and sour cream. Fresh lettuce, tomatoes, onions, green peppers, fresh mushrooms, black olives, croutons and cheeses. Fresh lettuce, tomatoes, onions, green peppers, fresh mushrooms, croutons, ham, turkey, and cheeses. Fresh lettuce, taco meat, tomatoes, onions, green peppers, black olives, cheddar cheese and taco chips. Pasta covered in our secret pizza sauce and your choice of 3 pizza topping ingredients (see pizza, above), topped with mozzarella and cheddar cheese served with garlic bread. Pasta covered with Alfredo sauce, served with garlic bread.